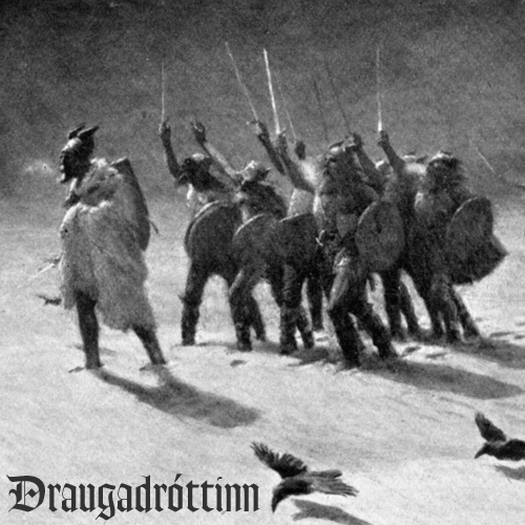 Draugadróttinn - Where the Sea Gives Up Its Dead from 2009 has been added to the Broken Limbs Recordings Bandcamp. This is four songs of hypnotic and melancholic black metal and blackened post rock. Dreamy guitar leads on top of a fuzzy bottom end, distorted and cavernous vocals, and the occasional acoustic thrown in. The production is excellent, and all of this is the work of one man: The album is written, performed, recorded, mixed, and mastered by Scott Byrnes. The name Draugadróttinn means "Lord of the undead" and is one of the many names for Odin in the Icelandic sagas. Half of the lyrics on Where the Sea Gives Up Its Dead are taken from Snorri Sturluson's The Prose Edda, the other half from William Falconer's poem The Shipwreck (thanks to Cordyceps Zombie Swarm for the info). Scott Byrnes has made the lyrics available on his website.